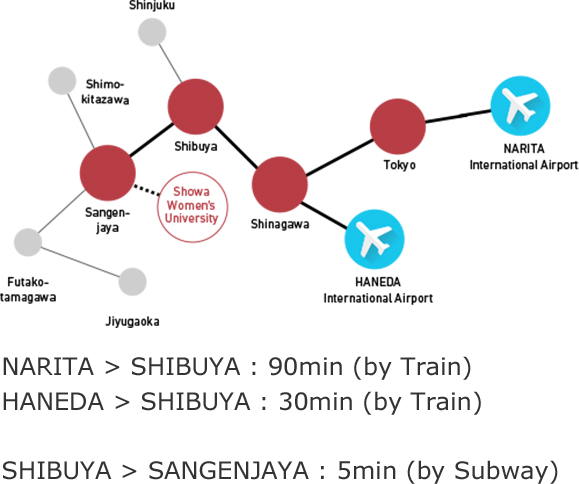 Showa Women’s University provides non-degree seeking international students with one summer program and two semester-long programs. SSIP is a special three-week program conducted in English. It is designed for international students who wish to learn about Japanese culture and study in a multinational setting. The program consists of Japan Studies and the Cross-Cultural Workshop. Japan Studies gives students opportunities to learn about various aspects of Japanese culture and society through lectures, field trips, and cultural activities including short homestays with Japanese families. Participants experience the vibrant Tokyo lifestyle while exploring both contemporary and traditional Japan. In the Cross-Cultural Workshop, students engage in intensive collaborative research projects with other participants representing different cultural backgrounds, and present their findings at the end of the program. Summer Program for International Students page of the CIE website. In this program, undergraduate students take regular SWU courses in 12 different departments. The program is offered in both the Fall and Spring semesters (15 weeks each). Students may study for either one or two semesters. Students must be in an undergraduate or graduate program at a university outside Japan, and must have attained N2 level on the Japanese-Language Proficiency Test (JLPT). *Students should submit the JLPT certificate when applying. Students are required to register in at least 7 courses to maintain their visa status, and are allowed to take up to 10 courses of their choice. Students may choose from a variety of courses including several Japanese language courses that are open to international students. Students register for classes during an orientation period. *Due to limitations on class size and the required Japanese proficiency level, applicants may not be able to take every class they apply for. Semester Programs for Non-degree Seeking International Students page of the CIE website. This program is designed for undergraduate and graduate students currently studying outside Japan, who wish to improve their Japanese language skills. In addition to the mandatory Japanese language courses, students have the option to take a few liberal arts courses of their choice. The program is offered in both the Fall and Spring semesters (15 weeks each), and students have the choice of applying for either one or two semesters. If students reach N2 level during the 1st semester, they may proceed to the SWU Academic Program for the 2nd semester. Students must be in an undergraduate or graduate program at a university outside Japan, and must have studied basic Japanese (JLPT N3 level or CEFR A2 level recommended) before arrival. Students are required to take the following three mandatory Japanese language courses. Students may also take up to two liberal arts courses of their choice, either in English or Japanese, depending on their language level. Through conversation-based lessons, students learn everyday Japanese that is useful in school, at home, and at work. Based on weekly topics, students learn active Japanese through media, interview sessions, and interactions with Japanese students. There are also visitor sessions where guest lecturers are invited from the Japanese business world to speak on a variety of topics. Students learn business manners and Japanese phrases used in business situations. They also receive advice on writing business emails and making business calls. The program prepares students for an optional internship.